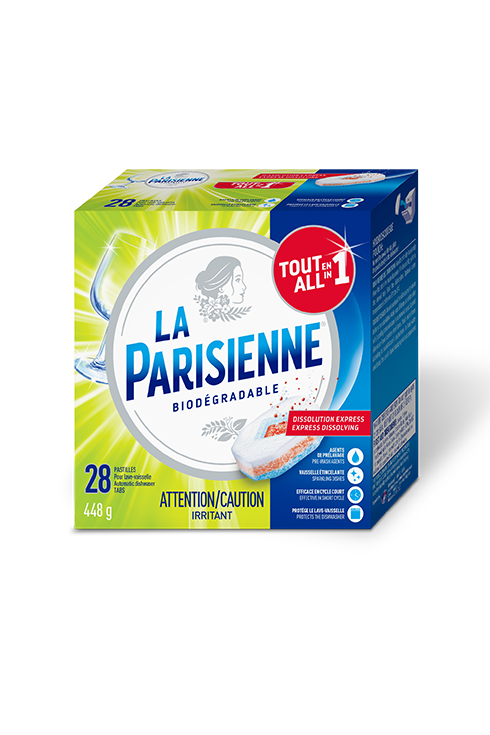 The new improved express dissolution La Parisienne All in 1 biodegradable dishwasher tabs for clean & sparkling dishes. Easy to use thank’s to the hydrosoluble pouches that don’t need to be removed. No need to unwrap the tab, the pouch dissolves in water! We are committed to providing quality products that live up to our customers’ expectations. If you have purchased La Parisienne All in 1 dishwasher tablets and are not completed satisfied, for any reason, we will reimburse you. See details and conditions on form. Save water: Instead of rinsing your dishes, just remove the leftover food before placing them in the dishwasher. *Biodegradable within 28 days according to the OECD 301F test standards as confirmed by an independent lab.